It's like Jitterbug is saying, "Human? Seriously, this is a speed bump." I used to show with a girl, also a recent convert to the uneventful levels of eventing from the hunter/jumper world, who would tell me she had terrible stage fright about the dressage portion. While I am never especially confident going into the sandbox (I frequently think of what a cruel nickname it is in fact, to make the experience sound like play when I’m pretty sure it was an undocumented torture device in ancient Europe), I thought when we started that I didn’t understand this phenomenon. Who cares if someone’s watching you ride? No one is watching your ride with interest except the judge, your parents, and your trainer. Anyone else on the sidelines is waiting for their turn, trying not to throw up. Worried about forgetting the test? Just practice it on your living room floor the night before. Then my horse and I progressed from greenie to starter, at which point she began actually jumping the fences, instead of hiking up her knees and trotting over them. You think I’m kidding about that last part, but I’m not. I spent the better part of one combined training stadium round getting popped straight up in the air because I basically choked her to such a deep spot at every fence, she chose to deer leap them, partly because she was just so EXCITED to see actual obstacles. We were still trotting fences back then. 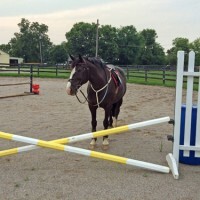 It takes talent to be that anxious about trot fences. That’s when I learned something about myself I had never known before—I freeze in the face of adversity. I suddenly understand possums now. You know how they get all glowy-eyed in car headlights and just kind of waddle around in the road staring at the thing that’s about to squish them against the concrete? I have so much more sympathy than I used to. If you guessed the last thing you want to do on a green horse is freeze and let them take over, you’d be right. Somewhere between six and eight strides away from every fence we cantered for the first few months, my entire body would go numb and all I could hear was a roaring noise, like a train rushing past my ears. Fortunately, Jitterbug loves jumping so much that instead of learning to stop when this happened, she learned to take charge. Sometimes we’d get a good spot and sometimes we wouldn’t, but it was never my idea. I didn’t have room for ideas. I bought a book titled, “Heads Up! Practical Sports Psychology for Riders, Their Families, and Their Trainers,” by Dr. Janet Sasson Edgette. I learned I am especially sensitive to jump height. I paid little attention to it when I was a Sunday lesson-taker as a kid, but I think I must have been jumping somewhere around 2 feet each week. We did gradually more technical combinations, but that was basically it, for years. So, even though my trainer had patiently brought the horse and I along with tons of preparation on the flat and lots of encouraging experiences at smaller jumps for literally years, the moment she started moving the rails to 2’3” and up, I would freeze more completely… even to the point that I would forget to breathe until a couple of strides after we’d landed and I’d realized I hadn’t died. Finally, I read an excellent Buzzfeed-style article comparing common jump heights to everyday objects. Did you know that 2 feet is the equivalent of 4.5 iPhones stacked end on end? And that 2’6” is just about the height of a fire hydrant, or a lab puppy? (Please, do not contact me and tell me if that is not true.) Who’s afraid of a fire hydrant, for goodness’ sake? I also read Denny Emerson’s Facebook posts (which are really mini columns) religiously and saw him suggest that riders afraid of moving a jump up find something smaller to jump until they are so sick of it that they move the rail out of boredom. So, we jumped 2’3” over and over, and it did get really… boring. Who would’ve thought? We were preparing for a move-up to beginner novice this fall and I’m proud to say we were jumping 2’9” at home with a few trips over a 3’3” oxer at a related distance (which is the only reason I didn’t have a meltdown and turn the horse around when I saw it. I’ve done it before). I am still working my way through Edgette’s book, and working through the feeling of being “stuck” more often than I should, but I finally have something I can visualize when I feel the sweat sliding across my palms, and that helps tremendously. You’ve gotten to know Jitterbug, the Chronicle’s Quadraped Correspondent, over her years of posting hilarious columns from a cantankerous draft-cross mare’s point of view. And now her “Human,” Natalie Voss, has joined our roster of bloggers to share her adventures as a hunter-rider-turned-eventer mounted on the ever-opinionated Jitterbug.